Black and white negative of a photograph of a postcard depicting Heydenshore Park beach. View looking toward the east. The cottages can be seen along the shoreline. 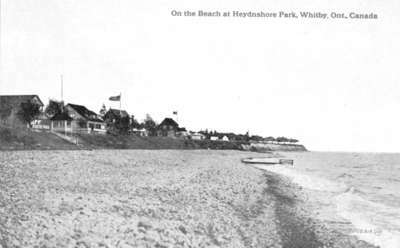 Heydenshore Park was a summer resort established around 1900 east of Whitby Harbour. A number of cottages were built there starting in 1900 and many were demolished in 1965 when the private park was sold to the Whitby Public Utilities Commission. In 1971 Heydenshore Park was sold to the Town of Whitby. Heydenshore Park Beach, c.1912, unknown photographer, Whitby Archives, 12-001-026.